Curvy fit from waist to hip. 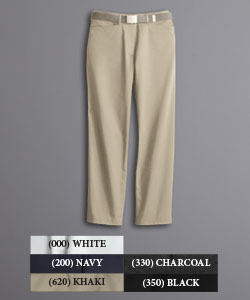 Cintas Comfort Flex® with an even softer feel. 11% mechanical stretch. Modern rise just below the waist, and fuller leg opening to fit over boots. Flat front with self-lined waistband. Angled front pockets to eliminate gapping.